As a Coffee Tech I did something that I am quite proud of, I rebuilt a 4 group head espresso machine from the boiler up. If you are a tech on this type of equipment, you can understand why I am proud of this achievement. I do not have a mechanical background like some of my peers do, my background is construction and mid management, but I have a strong aptitude for mechanical things. I see how they function and I feel how they work. It has not always been easy for me, I have made some mistakes, learned from them, and endeavor not make those mistakes again. 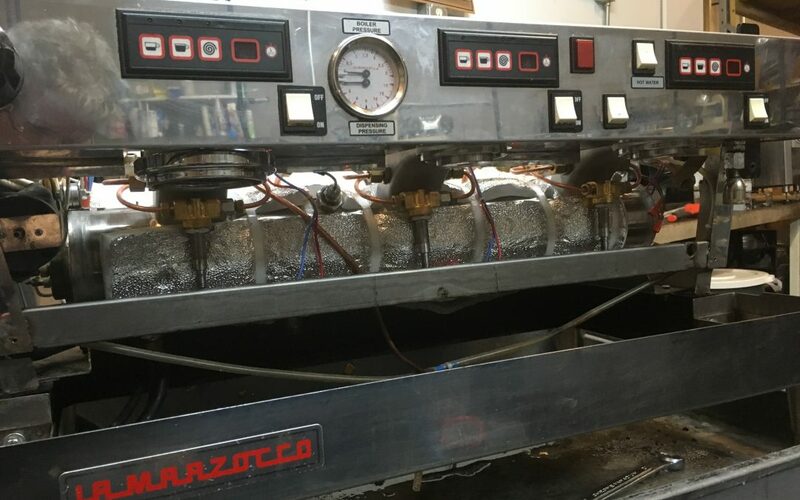 After 3 years of learning how, from a man with great patience, and participating in a workshop on the fine workings of espresso machines, it was exciting to rebuild an espresso machine in such poor shape, and have it go out the door whole, and working great! Am I a master at this? I don’t think so, not yet, but this experience has helped me recognize that I know a great deal more than I did, and has given me the confidence to move forward, and continue growing my skills. What was wrong with the machine? 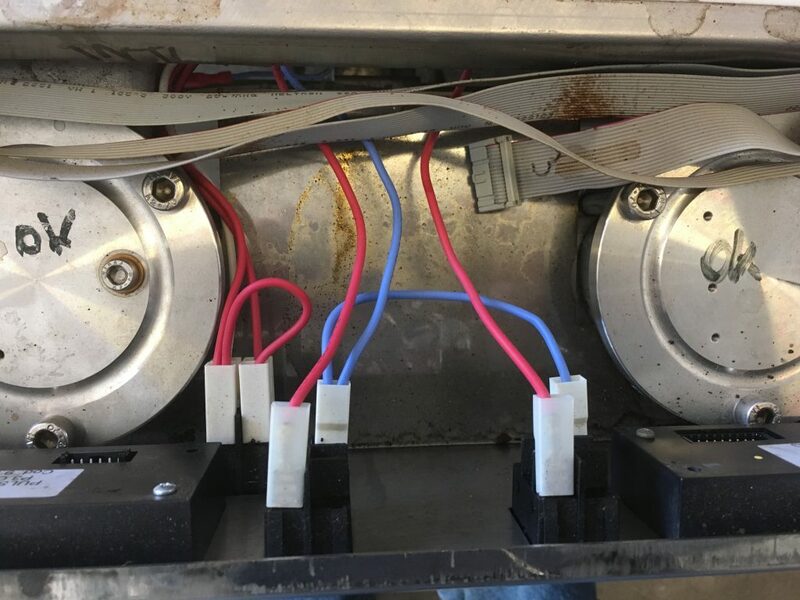 The espresso machine in question was missing a lot of things; the panels were put aside, the wiring was disconnected and toss around, without any numbering on the pins, or a map where the wires should go. 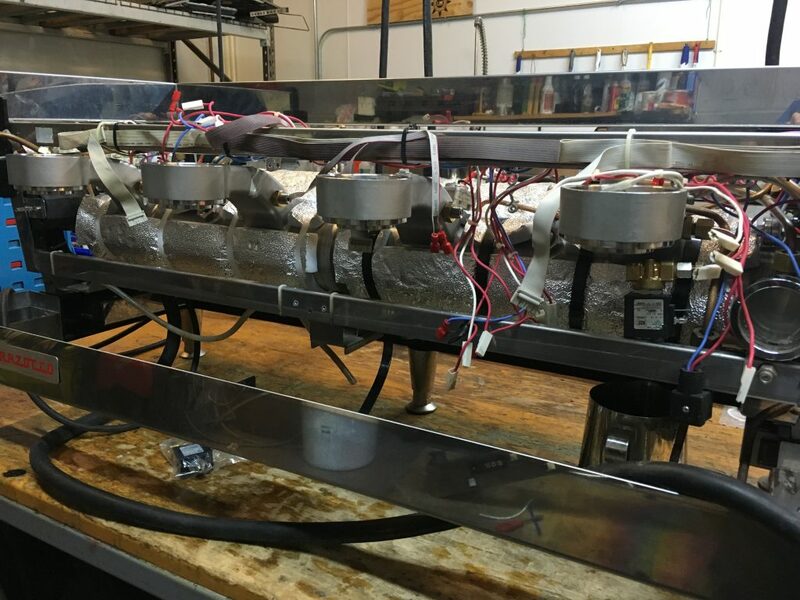 The coffee boiler had to be replaced due to a leak, so that meant that all the group heads had to be rebuilt with new parts and placed on the new boiler, with the added flow meters, and group valves, and then figure out which wires went where so it would work properly. The steam wands were in pieces, and I put in new O-rings and springs to rebuild them. The parts that were left on the original machine were plugged up with scale, and I had to clean them out with boiler acid and CLR. 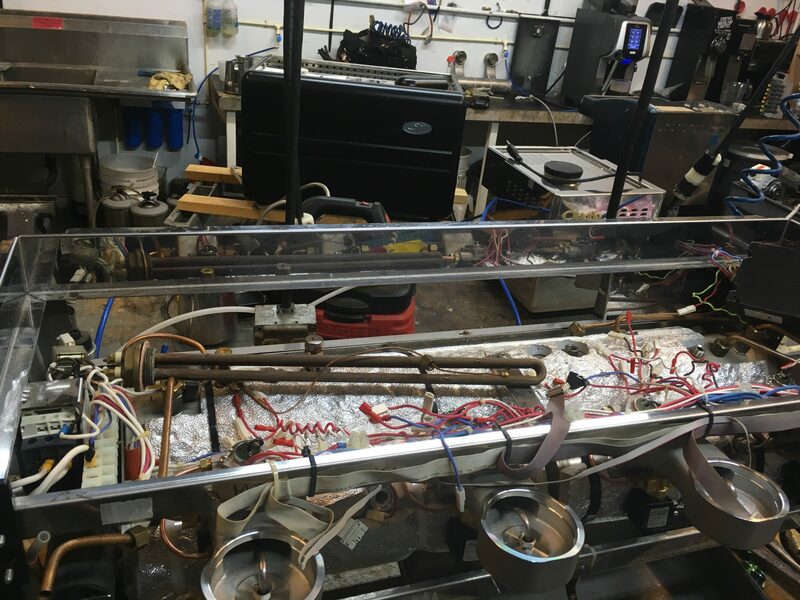 Once all that ground work was done, I then reassembled the espresso machine, made sure all the fittings were tightened properly, checked the wiring against the wiring diagram that I did have, turned on the water, looked for leaks. I crossed my fingers and flipped the power switch on! Much to my relief, it worked! The espresso machine came to life! I stood there quite happy with myself. This was my first solo gig, from start to finish, and it worked fine, just like it is supposed to. I savoir the moment, then filled out the paperwork, and started the next machine. A techs work is never done. Thank you for your offer, I at the time do not need your services.